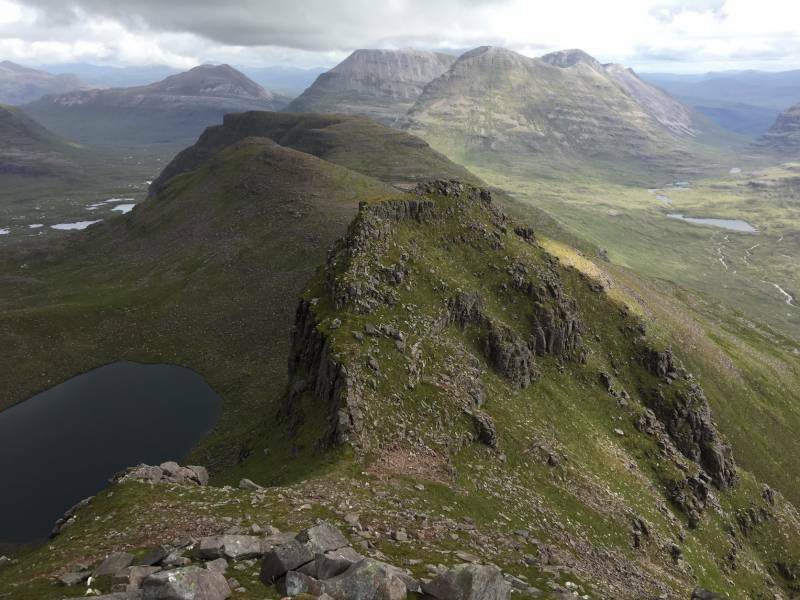 Beinn Dearg is the forgotten peak of Torridon, located as it is slightly back and behind of the more overt dramas of Beinn Alligin, Liathach and Beinn Eighe. 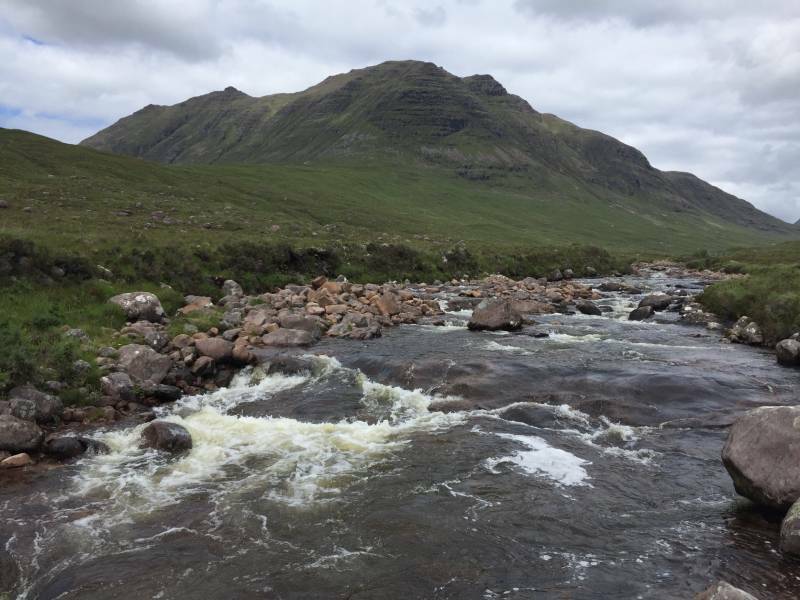 It also 'benefits' from falling just a couple of feet short of Munro status when it comes to solitude, but in every other way it belongs in this company, a lofty ridge well-defended by vicious slopes of terraced sandstone and crowned by a pinnacled crest. I did it on a cool summer day of cut-glass clarity, and I am mighty lucky for it. I started up the path up the east side of Coire Mhic Nobuil, through woodland thankfully free of bitey six-legged fauna in the low temperatures. 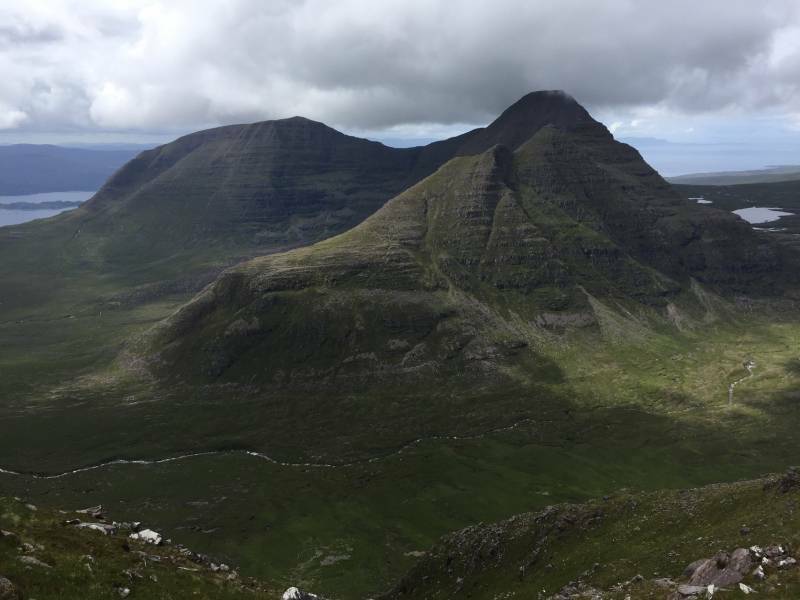 The track is excellent and easy, leaving plenty of time to examine the objective dead ahead and to admire the huge high summits of Beinn Alligin to the left. Branching off to the left another path (becoming rougher and wetter) led me up to the Bealach a' Chomhla. 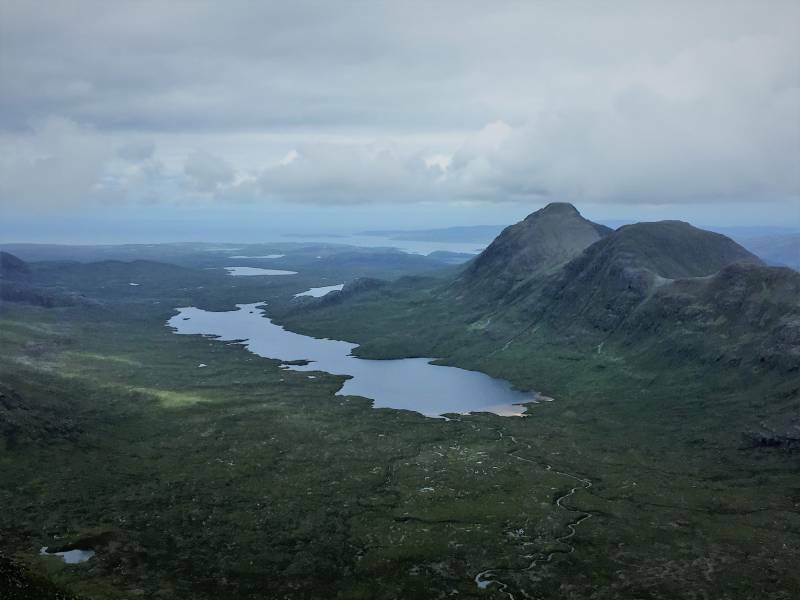 Immediately above were the huge cliffs under the famous Horns of Alligin, while on the other side of the col lay the way up to Dearg's northern outpost Stuc Loch na Cabhaig, a blunt spur of steep grass, boulders and rock steps. This proved straightforward enough under benign conditions, but would be quite a route selection test in bad weather. (Also, it's worth bearing in mind that in areas like this with a surfeit of geographic detail, sometimes hillwalking guides don't mention stuff you might want to know. With that in mind, I'm telling you that the burn at the bealach here was quite tricky to cross after a day of heavy rain). Stuc Loch na Cabhaig is a fantastic belvedere, with excellent prospects of the other Torridon mountains, but it particularly excels in the view north, an overwhelming wilderness of lochs, glacier-scoured lowlands with the stark monoliths of Baosbheinn and Beinn an Eoin rearing from it; the Flowerdale Forest. A short descent and an easy climb up a rocky crest led me to the main summit, a plateau sharply defined by the edge of the northern corries. The ridgeline continued south for a few hundred metres before turning sharply east and becoming 'interesting', over an initial squat and easy pinnacle before the crux traverse of what is generally known as The Castle. A sharp descent to a col was followed by a much narrower crest, straightforward but with a sobering drop to the left, and then an even sharper descent down three chimneys in succession; all on big comforting holds but with some big reachy steps down thrown in there. This section can be avoided on a thin contouring path on the right. 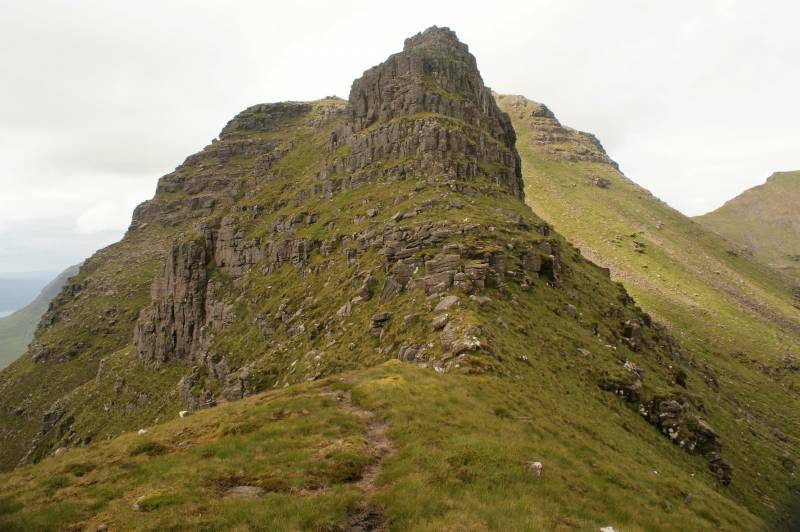 The ridge is now much broader on the way to the final top of Carn na Feola, with another jaw-loosening northward and eastward view. From here I headed back directly south to the edge of the ridge, and a steep descent back down to valley level: Beinn Dearg is great fun to traverse, not so much fun to access and exit. I met a path west of Loch Grobaig; rough at first, it soon became very easy underfoot and led back to the path from the ascent for the walk back to the car park at the foot of Coire Mhic Nobuil.